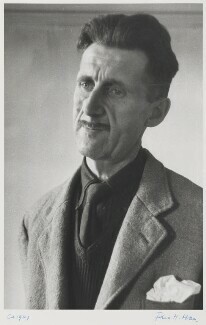 Author, essayist and critic; achieved fame with his politically charged novels Animal Farm (1945) and Nineteen Eighty Four (1949), and also wrote for the New Adelphi and the Observer. In the 1930s he travelled to Spain to cover the Civil War and eventually took up arms with the United Workers Marxist Party Militia against Franco. The experience, detailed in Homage to Catalonia (1938), turned his sympathies against communism, though he remained a proponent of English socialism.